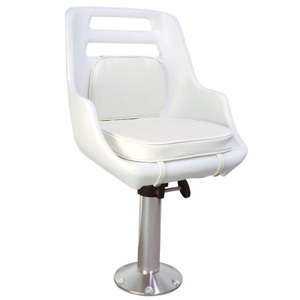 Our popular West Marine Skipper Chair and Pedestal Package includes the chair, pedestal and connector. Boat seats range from very simple to quite sophisticated. To choose the seat that will work best for you, decide how it is to be used, then pick component parts that will safely and efficiently fill your needs. First, decide whether a stationary seat is sufficient or whether you need one that moves vertically and/or horizontally. Then contemplate how it will be used-comfort and safety considerations depend on whether the seat is used when the boat is planning, trolling or only when not underway. The American Boat and Yacht Council (ABYC) defines Type A seats as "designed for occupancy while the vessel is underway at any boat speed," and Type B, "designed for occupancy only at boat speeds not exceeding 5 miles per hour." It is best to design the system from the deck up. The base for any seat is, well, the base itself-a pedestal and anchoring combination that integrates with other elements. Boat seat pedestals are of two basic types: the "pillar" that uses a ring base to attach permanently to the deck, or sole, of the boat, and the removable, pin or wedge types that are generally more slender and slide or screw into deck-mounted plates. If you just want a simple seat that is of a fixed height (like at the helm) all you need are a base, pedestal, connector and the seat itself. But if the seat assembly is to be multi-functional, you need a pedestal that allows you to at least adjust the seat height. To achieve added versatility, you may want to add other connectors and components. In addition to a swiveling spider, you might want to select some sort of adjustable sliding mechanism to build a more functional seating system. Or you can choose a swiveling mount that is multi-functional, allowing the seat to be adjusted fore and aft. Most allow the seat to be turned and locked into position over a 360º range. For ultimate seat comfort, you might even want to add a shock-absorbing mechanism. Choose a seat that allows the most possible options. It should comfortably meet all the expectations you or a future owner might have-be it fishing, water skiing, racing or relaxing. To ensure maximum enjoyment of your new seat, follow the advice of the ABYC. They clearly state load criteria for seat fore and aft locking mechanisms and vertical adjustment positive locking mechanisms. 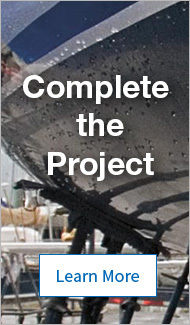 Although the Standards were developed for seat and boat manufacturers, recreational boaters retrofitting or repairing their own boats should make sure all components meet these minimum materials and fasteners are suitable for anchoring a pedestal to the deck. For instance, they say, "Fasteners of #10 diameter or larger shall be spaced to provide the required strength in all directions and shall not be threaded into sole panels made of plywood alone." They further specify that woods treated to resist decay in the marine environment be used; ferrous metals should be hot-dipped galvanized, electroplated or stainless steel; and that copper and copper alloys must not be used in contact with aluminum.